Common side effects include paleness, pimples and paralysis. Here’s the truth of hands in the pants: It doesn’t just make you go blind — it kills you dead. 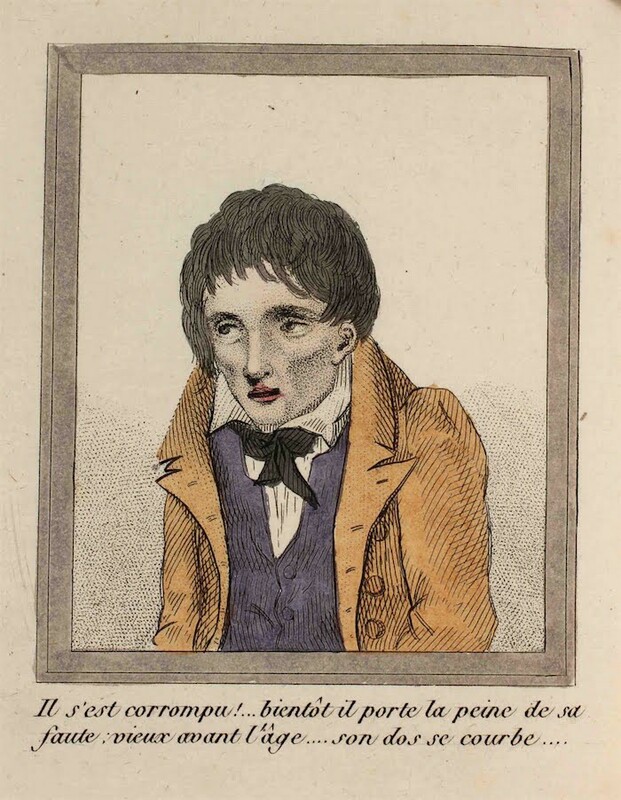 Or so preacheth the author of the 1830s tract “Le Livre Sans Titre” (The Book With No Title), another installment in that era’s relentless puritanical assault on the joys of self-abuse. What sets this one apart is that it came illustrated. 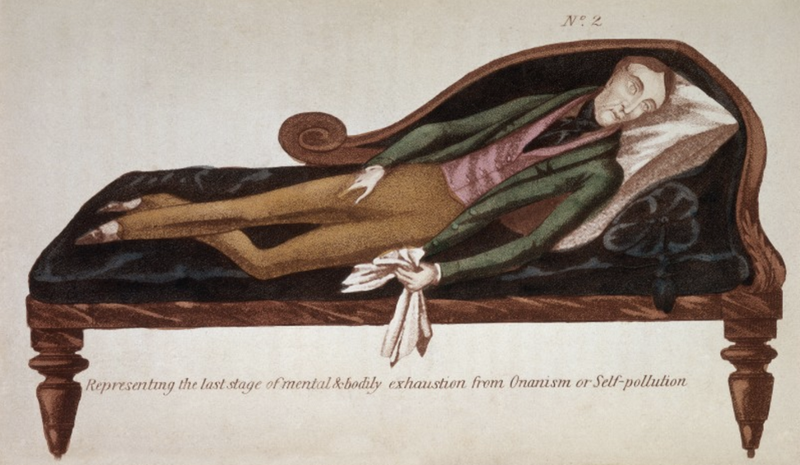 Before we get to “The Book With No Title,” though, take a look at what its predecessors had to say about the topic of onanism (an old-fashioned word for masturbation). Holy moly. It sounds like a Chantix commercial. He was young and handsome… his mother’s hope. He became corrupted! Soon his crime makes him old before his time. His back becomes hunched. A devouring fire burns up his entrails; he suffers from horrible stomach pains. See his eyes once so pure, so brilliant: their gleam is gone! A band of fire surrounds them. He can no longer walk; his legs give way. 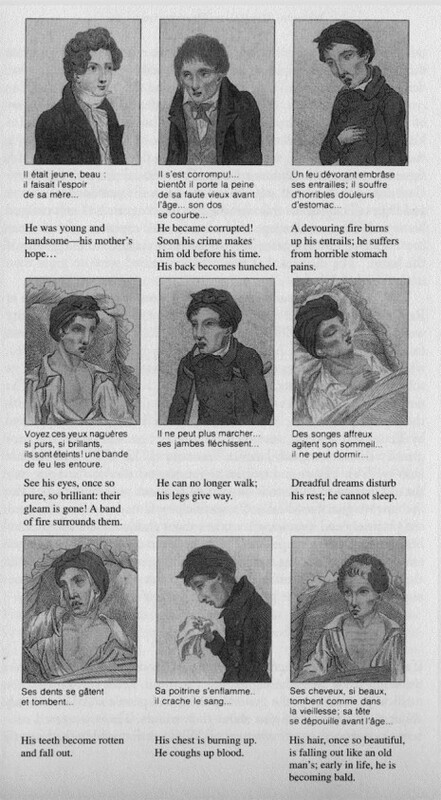 Dreadful dreams disturb his rest; he cannot sleep. His teeth become rotten and fall out. His hair once so beautiful is falling out like an old man’s; early in life he is becoming bald. He is hungry and wants to eat; no food will stay in his stomach. His chest is buckling. He vomits blood. His entire body is covered with pustules, he is a horrible sight! A slow fever consumes him. He languishes; his entire body is burning up. His body is becoming completely stiff! His limbs stop moving. 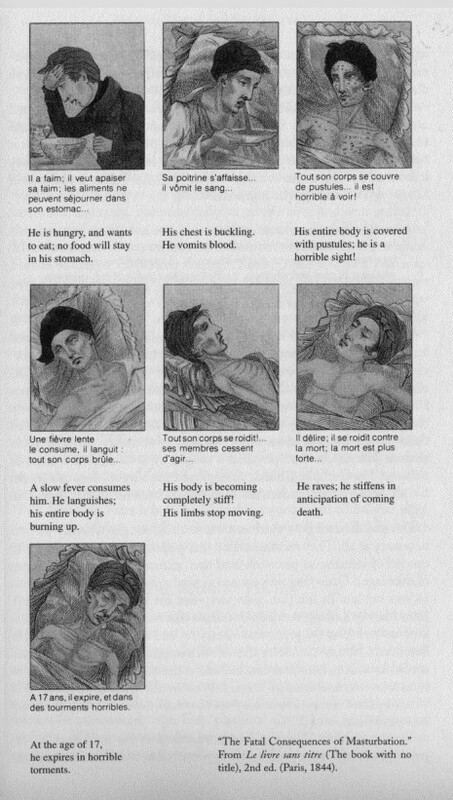 He raves; he stiffens in anticipation of coming death. At the age of 17, he expires in horrible torments.